Speed can do better. He lacks persistence, focus and discipline. Starting with arithmetic in primary school, and then geometry, algebra and later calculus, I found that I could stick with it, be focused and be disciplined. I liked the problems I could solve, I enjoyed the challenges and I found that I could do it. Who wouldn’t like the idea of estimating the height of a tall tree by stepping away from it 50 metres, measuring the angle subtended by the tree, and doing a little calculation? I did that in a local park. In the Scouts we’d wander around the countryside north of Melbourne with a prismatic compass in hand, exploring and surveying, solving triangles. I wasn’t quite Eratosthenes estimating the circumference of the earth, but I was similar. Later we learnt about rowing across a river flowing at a given speed in order to arrive exactly opposite your starting point. Later still, we learned to derive the motion of the planets around the sun from Newton’s inverse square law. Who couldn’t be mesmerised by all this? In my first year at university I began a combined science and medicine degree, as I hoped to go into medical research. I wanted to do good, but my bad behaviour returned. Now I lacked the persistence, focus and discipline to do the experimental side of my course, to master the test tube, the beam-balance, the microscope and the scalpel. Maths was, as ever, doable, enjoyable and easier, and so that became my path. But my unfocused and undisciplined interest in biomedical science, my desire to save lives, never left me. Statistics proved to be the link between the world in which I felt comfortable and the other world I wanted to join. I learned how to answer scientific questions by analysing data. Doing this, and teaching others to do it became my life’s work. The 1950s saw breakthroughs in the world of proteins and DNA, with genetics and evolution providing the bigger picture. I glimpsed these in 1961 in my first-year science/medicine course, but left them for the world of maths and stats. As time went on these two worlds converged. By the 1970s it had become clear that maths and stats were essential to make sense of data on proteins, DNA, genetics and evolution. By 1990 this had become my life, and it’s what I do today. I still face the same challenges of persistence, focus and discipline, for I need to understand the biology of my collaborators. But with my primary focus being the analysis of molecular data, I finally seem to have achieved a workable balance. No more negative school reports. 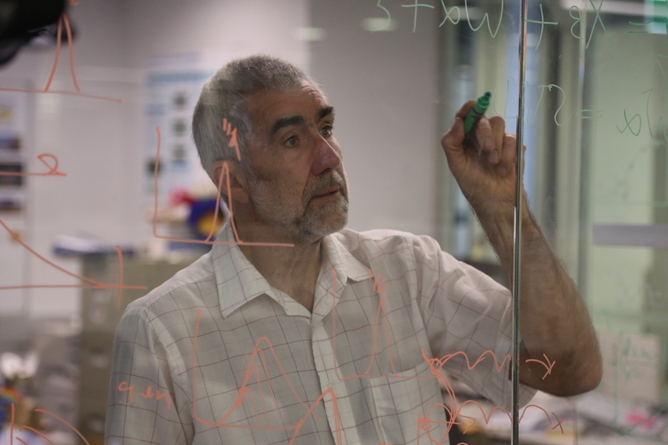 Terry Speed is Professor of Bioinformatics at Walter and Eliza Hall Institute. This article was originally published at The Conversation.